When thinking about the types of homes that use solar energy, a big mansion with three sports cars parked in front comes to mind. However, a recent study has found that in reality, it’s more like a typical house in the suburbs with a minivan in the driveway. It turns out that people who use solar power aren’t quite as filthy rich as we thought. 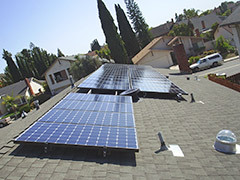 According to an article by Anne C. Mulkern and ClimateWire published in the Scientific American, the Center for American Progress (CAP) has found that most of the solar energy installations in California, Arizona and New Jersey are overwhelmingly found in neighborhoods where the average incomes were between $40,000 and $90,000. Meet the new middle class. "Middle-class homeowners are overwhelmingly taking advantage of rooftop solar. It really is becoming more of a middle-class tool and a middle-class energy resource,” said Mari Hernandez, research associate at CAP. The middle class has been busy getting solar power to their homes and offices. In fact, solar energy installation for residences and commercial buildings has increased 46 percent since 2011. Last year alone, 90,000 rooftop solar installations were put in by homeowners and businesses, according to an article by Marc Gunther in Yale Environment 360. As these numbers continue to rise, utility companies will react. The question is, how? Some utility companies are trying to get legislation enacted that would cost people who use solar energy more by imposing extra charges or reducing incentives. Other utility companies are teaming up with solar companies and embracing the new business opportunity. Let’s hope that the latter remains true so that solar energy installations can soon be an option for anyone. Posted on November 1st under Energy of Stars.